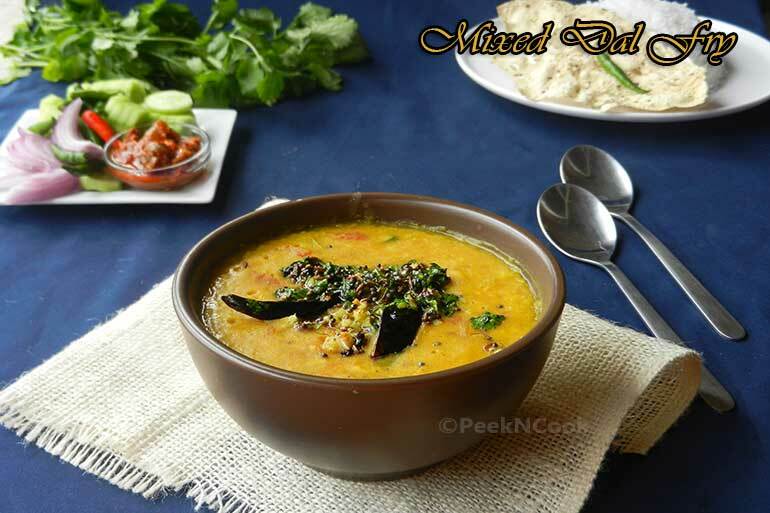 Dal (also spelled dahl or daal) is a preparation of pulses /dried lentils which have been stripped of their outer hulls and split. It also refers to the thick stew prepared from these pulses, an important part of Indian cuisine. It is regularly eaten with rice and vegetables in southern India, and with both rice and roti throughout northern India . It is regularly eaten with rice and vegetables in southern India, and with both rice and roti throughout northern India . Mix all the dals together and wash them properly. Soak them in 3 cups of water for 30 minutes before cooking it. Pressure cook the dal in 2 cups of water with salt and 1 teaspoon of turmeric powder till done. Take a kadai or wok and heat ghee and 1 tablespoon of oil and fry the onion till golden brown. Add tomato, green chili, red chili powder, garam masala powder, turmeric pwd cook for 1-2 minutes adding little water to it to ensure that the mixture does not get burnt. Now add the cooked dal and mix them well. Add a little more water to it to bring it to the desired consistency. Bring to a boil and simmer at least for 10 to 15 minutes. After 15 mins pour the dal in a large bowl. Now take a small sauce pan and heat the remaining oil in it and add cumin, mustard seeds, whole red chili, ginger, garlic, chopped cilantro and some lime juice and when it starts cracking pour on the cooked dal and serve. Serve in lunch menu with steamed rice , papad, and salad. This Dal does not need anything else. This is an authentic North Indian dish can be served with rice or roti.